Your white label dashboard has gotten a makeover. Find out how to get around. Previously, you navigated throughout your dashboard with a menu on the left-hand side of the page. To clean up the dashboard and simplify your navigational options, we've moved that menu to the top of your screen. Home - Takes you back to the homepage from your current page. 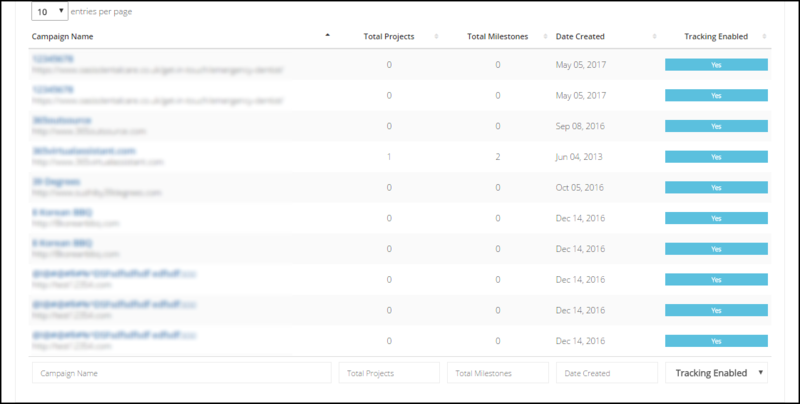 Campaigns - Takes you to an overview page of all of your campaigns showing the name of the campaign, the URL, the number of projects and milestones, the date created and the ability to enable tracking for each campaign. Store - Access the store. This page has been updated as well with new icons. Tools - Many of the items listed under the old menu have been moved here. Many of the items here you use sparingly and the items that are used frequently can still be accessed from the homepage - specifically web audits and proposals. Find out more about the individual items in the Tools section by reading Updated Navigation: Tools Section. Resources - Find all of the brandable resources including pitch decks, white papers, and other training materials. An additional change is a gray bar beneath the campaign menu where you can find additional options. The available options on this gray bar will vary by page. For example, this is the gray bar from the Tools section. One item that you can find consistently on this bar is the Select Campaign drop-down where you can easily and quickly access a specific campaign.